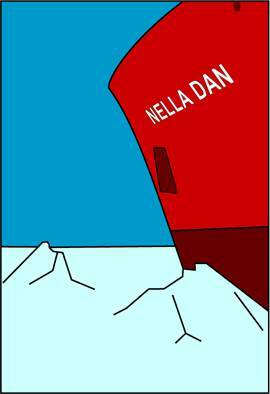 Over the years, documentation related to Nella Dan’s operations and life on board the ship has been captured from a wide variety of sources, including logbooks, magazines, the independent ship’s newspaper, articles, radio reports, personal accounts, letters home, artefacts and many other formats. For many years, this diverse material has been scattered far and wide. In recent years, several good initiatives and partnerships have shot up in different locations. In both Australia and Denmark, there is significant interest in collecting and preserving these unique testimonies. The official documents from the shipping company Rederiet J. Lauritzen are currently kept at the Danish National Archives, and in both Australia and Denmark there are several archives run by private enthusiasts or associations. Other official archives in Australia are maintained by the AAD, ANARE Club and Australian Antarctic Data Centre (AADC). In addition, the Lauritzen family maintains an invaluable film and image archive. Friends of Nella Dan aims to work with others to offer an overview of the existing archives and private collections and promote mutual contacts and links. As part of the association’s activities, Friends of Nella Dan also aims to collect sources and personal accounts in order to make them accessible on our website. An important outstanding task concerns the collection of personal accounts from former crew members, scientists, station staff, guests on board and friends of the ship. In cooperation with Springeren – Maritime Experience Centre in Aalborg and with funding from the private foundation Lauritzen Fonden, Friends of Nella Dan have set up the Nella Dan Archive as a database for recording collected material. Our main initial focus is on recording, collecting and digitizing existing footage. The Nella Dan Archive is an online archive that is operated by Friends of Nella Dan and Springeren. The online archive offers general public access via the Friends of Nella Dan website and the library and permanent collection at Springeren. The database structure allows for future expansions of the archive, including the addition of separate databases with images and footage of other ships.